Welcome to Dominique and his Flying House Cats! The best cat show on earth! Portrait of Dominique with Sara, Piggy and Sharky. Official home site for Dominique LeFort and his incredible trained house cats, Oscar and Cossette, Sharky, Sara, Chopin, George and Mandarine. 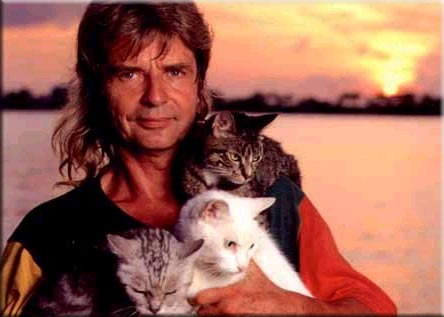 The world renowned entertainer, animal trainer and cat trainer known as Dominique the Catman performs regularly at Westin Pier for Sunset Celebration adjacent to Mallory Sqare in Key West, Florida. This incredibly talented performer is admired by everyone from children to senior citizens and has acquired a huge following who adore his show. No trip to Key West would be complete without experiencing his act. To hire Dominique and his flying house cats click here! Piggy, Spot, Mars and Sharky have already rejoined the universe. Thank you for having entertained so many children. Happy nine lives to you! where no one yells at you! Clap clap clap for all of you! Copyright © 1999 by [Dominique's Circus Cats]. All rights reserved. Revised: 29 Dec 2018 12:32:53 -0500 .